As regular readers will know, chocolate on this blog comes in many forms. This time it comes in the form of a jigsaw. A wooden Wentworth jigsaw, entitled Decadence, to be precise. The chocolates depicted on the front of the box look decadent indeed. I can’t help but wish that on completion of the jigsaw those tempting looking chocolates would turn into the real thing. Maybe it will, who knows? I haven’t completed the jigsaw yet. In fact, I haven’t even started it. My table is just too cluttered with Christmas stuff at the moment and with the best will in the world, there is no room for a jigsaw. However, it will be clear by Christmas and I am really looking forward to getting stuck in. I love doing jigsaws. My mother loves them too, so once I’ve tackled it successfully, it will be passed over to her to have a go. This is not a large jigsaw, being only 250 pieces, but it looks to be a tough one with the similar colours and repeating pattern of the chocolates. That’s lucky, as I don’t like my jigsaws to be too easy. It’s also rather a tactile one as the pieces are made of wood and are actually quite chunky but with a pleasingly smooth finish – no splinters to spoil the enjoyment here. The pieces are also wonderfully quirky, or at least some of them are. On sifting through them I found several shapes suitable for a food loving person: a spoon, a fork, cakes and pieces of chocolate to name but a few. I understand there is even a chocolate fountain dripping with chocolate, but I didn’t come across that one. When I first opened the box, I was delighted to see a drawstring cloth bag containing the pieces rather than the inevitable utilitarian and rather annoying plastic. The box itself is sturdy and is not likely to fall apart with a bit of rough handling, not I hasten to add that I would handle my boxes or anything else roughly. There is no doubt about it, this jigsaw is not only a thing of beauty but also of exceptional quality. Wentworth Wooden Puzzles have been going since 1994 and have earned a name for themselves for both design and execution. Decadence comes in several different sizes, the largest being 1,500 pieces. This 250 piece version retails at £26.95 and would make a fine gift, Christmas or otherwise, for any puzzle lover. 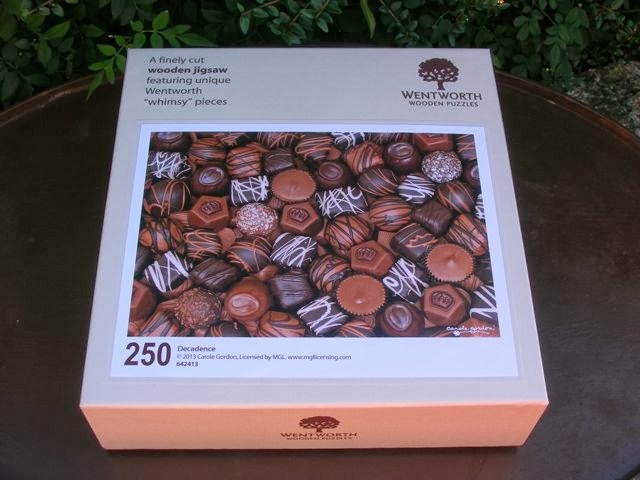 Wentworth have kindly sent me a second jigsaw to give away to one lucky Chocolate Log Blog reader. To be in with a chance of winning, please fill in the Gleam widget below. You will need to leave a comment on this post which then gives you additional chances to enter if you so wish. Gleam will pick a winner at random from the entries received. If you are commenting anonymously, please give me some way of identifying you as I will be verifying the validity of entries. Any automated entries will be disqualified. This giveaway is only open to those with a UK postal address. Because of the Christmas rush, winners will need to respond within 24 hours of being contacted. Failure to do this will result in another winner being picked. Prizes are offered and provided by Wentworth and Chocolate Log Blog accepts no responsibility for the acts or defaults of said third party. I love the Saturday giant crossword in the Daily Mail. Cryptic Crosswords and Logic Grid puzzles are my favourites. I love jigsaws and sudoku and word puzzles like crosswords and arrowords. I always have some kind of puzzle on the go. I enjoy doing Sudoku and crosswords in the Saturday Mail. Sudoku,I do them every day. I love the logic puzzles where you have to deduce a story from a series of statements. Love love love Jigsaws and puzzles! Wordsearch, and I enjoy doing Jigsaws. I love brain teasers in video games, sometimes the clues are obvious (pull the glowing lever), some are classic fourth wall problems (“Enter the code from the CD case” – gamers spent ages looking for a CD case in the game but it was actually written on the cover of the case that the game came in)! I was also brought up on Patience, I think it was my mum’s way of keeping me quiet by throwing me a pack of cards, and I still enjoy games of Patience to this day. Cryptic crosswords – nearly always get stuck with some of the clues though! I love jigsaws! We had Wentworth’s ‘The puzzle that made christmas’ and it took all the family nearly 4 hours on boxing day! Brilliant fun! I,m rubbish at most puzzles for some reason, but jigsaws I can just about manage, and chocolate is always good! Hanjie puzzles – they’re so addictive! I have recently revived a love for Scrabble. It definitely makes you use your brain! Jigsaws bring a family together – no-one can resist adding a piece. I like sudoku and jigsaw puzzles. I like doing jigsaws, my dad gave me a very difficult one for christmas. Love a good game of scrabble! Sudoku – drives me half crazy but they are addictive! The giant Saturday crossword in the Times! I love jigsaws and crosswords! i would buy my very own massive box of chocolates to scoff while doing the puzzle,what a better way to relax… just bliss..Makes me want to do this puzzle right now infact hehehehehe! It has to be the Times crossword. Crossword puzzles get the grey matter working! I always do the Daily Telegraph Saturday prize cryptic crossword! I like doing jigsaws and crosswords. Think probably nonograms are my favourite brain teaser. I love to do a sudoku a day!